In butterfly photography it is as important to get the subject (the butterfly) in focus and well-composed, as it is to get an uncluttered background so that the subject does not have to compete with too many elements in the photo for the viewer's attention. Many of ButterflyCircle members' shots depict creamy clean backgrounds, often green, that allow the subject butterfly to 'pop' out prominently in the photo. 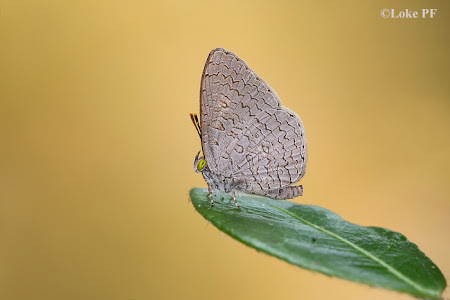 In this shot, taken by ButterflyCircle member Loke PF, a different coloured background (from the usual green) does well in focusing the viewer's attention on the diminutive Apefly. In this case, the salmon coloured background helps to contrast well with the grey of the butterfly and the deep green on the leaf that it perches on.